During Libra season we are more aware of the need for balance and this Full Moon at 18° 24′ Aries on October 11, 2011 07:05 PM PDT brings more fire into the sky. The New Moon had a pot load of Libra planets and a preponderance of air, so this fiery Full Moon introduces a sense of proportion . . . something Libra loves! The sober conjunction of Saturn in Libra and the Sun is not going to let anyone forget the importance of reciprocity and compromise, even though the Moon in Aries trine Mars in Leo urges us to consider our own wants and needs as well. This opposition has much to teach us about respecting our need to act as individuals whilst not neglecting the ‘others’ in our lives. Any self respecting Libra will be happy to tell you maintaining this balance is a work in progress and part of the human condition. Jeff Jawer wrote a brilliant post on The Libra Side of Relationship that I encourage everyone to read. Mars in Leo is also sextile to the Sun-Saturn conjunction and I love this aspect because the outgoing enthusiasm of this Mars helps keep Saturn from being quite such a stick in the mud. It also encourages us to take action rather than sit around rehashing all the pros and cons regarding a certain decision. Mars is always happy in the fire signs and loves to share this joy. Mercury is crossing the last few degrees of Libra, preparing to enter reserved Scorpio on 13 October. Meanwhile it will trine Neptune in Aquarius inspiring us to dream of a collective where people come before profits among other things. Novel idea that. Mercury-Neptune trines are excellent for creative thinking and wonderful influences on artistic types of all kinds. Moving on to Libra’s ruling planet Venus, now in Scorpio, where she is considered in detriment. Pluto in Capricorn offers her support via a sextile that is offset by an inconjunct to Uranus in Aries making Venus irritable and restless. [I have noticed Uranus is very potent in hard hitting Aries and consequently seems to have a powerful impact on other planets, at least compared to the period when Uranus was in subtle Pisces.] Aries can be very jarring to Scorpio because Aries sees nothing wrong in sharing what Scorpio deems private information – not a happy scenario. Pluto on the other hand is all too willing to aid and abet Venus in its home sign by putting up ‘keep out’ signs. The upshot is we need to be very clear with our intimates and lovers what information can be shared and what cannot. As a rule of thumb fire and air signs tend to be less concerned about privacy than earth and water. We see the resurgence of the wonderful trine between Jupiter in Taurus and Pluto in Capricorn in the sky which will be exact on 28 October. This will probably be of more help on an individual level though we may see renewed confidence in economic conditions around the globe over the next few weeks. One can only hope. By the way, the last trine between these two heavy weights takes place in March 2012. Relationships and associations of all kind continue to be the main focus on this Full Moon. All the issues stirred up by the New Moon are up for review but now we need to make our decisions and move on one way or another. The Full Moon lights up the whole picture and we will be given the information we need for making the best choices. Won’t hurt to be kind and thoughtful during the process, just don’t procrastinate any longer. Best thing to remember is if we clear away what isn’t working (and probably hasn’t in a long time) we make room for something far better in our lives! On a personal note: This is a mixed bag for me. I have Mercury conjoining my Sun, great for improving my ability to communicate. Saturn is past my Moon and still far enough away from my Sun to keep out of mischief and Venus in Scorpio will shortly conjoin my natal Jupiter. However, Mars in Leo is exactly conjunct my natal Pluto, triggering all my natal Pluto aspects, potentially bringing on bouts of irrational rage. Jupiter is opposing my natal Jupiter and squaring my natal Saturn – ALL about shaking out all the old stuff holding me back to clear the way for something new. Plenty to keep me busy! Yeah, I thought this Full Moon looked pretty good, until I realized that Mars will be conjunct my Uranus — always the trouble-maker with my Ascendant/Moon. I have a social/networking event that evening — will have to watch myself! 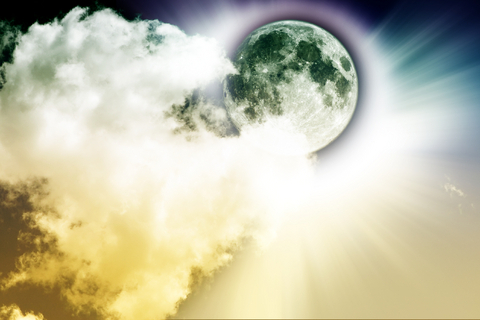 This full moon will be directly opposite my sun at 18 Libra (on my birthday). Will this full moon set the tone for my year ahead? Generally speaking, if the day of the Full Moon is the day your Sun returns to it’s exact natal degree, then your Solar Return chart will be very similar. You can use Astro.com to calculate a Solar Return chart – just be sure your current location is entered as the reference place. Either that or you can send me your birth data & current location and I’ll send you a copy of your Solar Return. Just use the form on my Personal Reports page. It’s interesting, but two couples I know have separated in the last few days. One couple are family friends who are basically family by now, the other couple is my next door neighbor. I guess it was a long time coming for the first pair, and not sure how the second pair have been at odds. It’s clear they each want different things and need to go their own way for now or for all time. We’ll see. My money is the first situation is (a) and the second is (b). Times like this I would LOVE to know the natal charts of all concerned! My ASC is 20 degrees libra and my Venus is 15 degrees Leo. I’m curious to see how this full moon will p,ay out for me. And I will be very happy for Saturn to move out of my 12th house! Thats been a tough one…. And I will be very happy for Saturn to move out of my 12th house! Thats been a tough one….